Stuck for a lunch idea? What about an afternoon tea? Scones are easy and quick to make, paired with an egg mayo & cucumber sandwich and a steaming pot of tea! * Add the sultanas and milk, bring the mixture together using a blunt knife. *On a floured surface, flatten the dough with your hand until it is around 3cm thick. *Using a 6cm fluted cutter, cut out rounds, bringing the dough together each time until it is all used up. Place on a baking tray and brush the tops with beaten egg. Bake for 15 – 18 mins at 220C //Gas mark 7 until golden brown on top and the bottom sounds hollow when tapped with your finger. 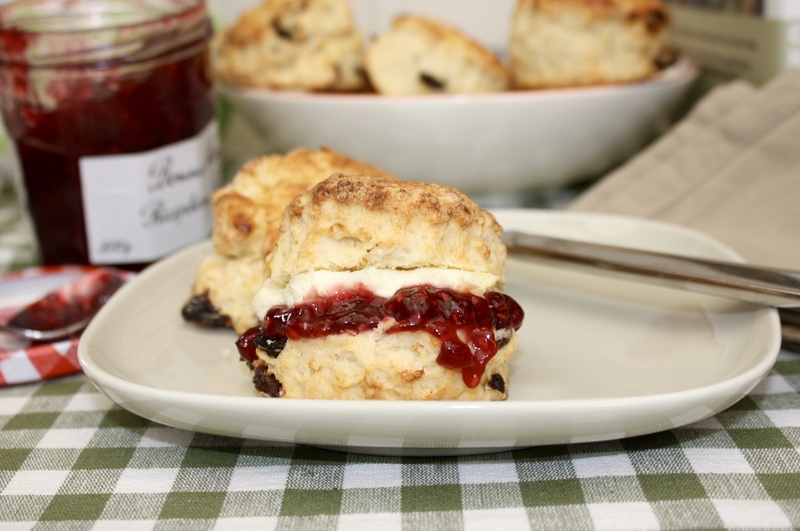 Serve with jam and clotted cream for an extra special treat! « Free Starter Kit with Every Chicken Eglu & Find the Golden Egg to Win!